Much like those girls who had the perfect metabolism until college introduced them to keg stands and late night pizza, I had perfect skin that no matter what I did to it — and I should mention I had a passion for putting frosting on my face like Mrs. Doubtfire at every single birthday party I attended in the 90s– but my skin was always radiant and pimple free. That is until college when Mount Rushmore decided to relocate to my face. 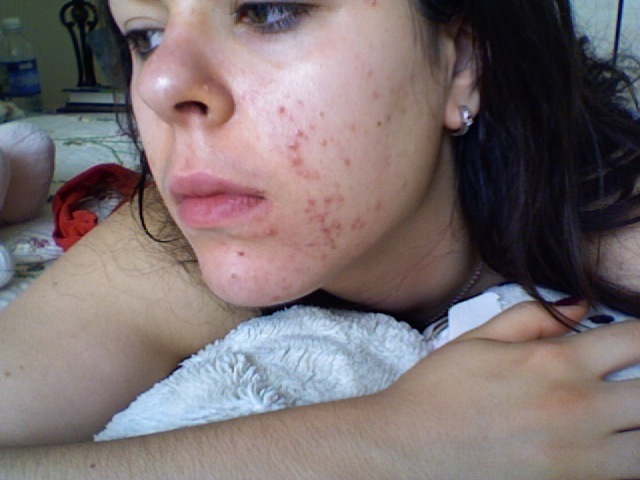 And since then, I have been desperately trying anything and everything to get my skin back into tip-top shape. From Pro-activ to apple cider vinegar (both drinking it (gross) and putting it on my face (that is, until the boy I was dating at the time told me my face smelled like a salad)), prescription meds, lotions and potions from the Dermatologist that come with a laundry list of things to beware of, supplements, laser treatments, facials, cutting out diary, cutting out gluten, pro-biotics… You name it, I’ve tried it — and I’ve probably shelled out a least a few fancy schmancy vacations worth in the skin care goods department. But I finally found a skin care line that is not only good for you (No harmful chemicals! No preservatives! ), it… WORKS (cue the fireworks and the clear skin). Haunted by another breakout in January, I stumbled into a local shop here in L.A., The Detox Market where everything in the store from their makeup to their cleaning products contain no toxic chemicals (adore that!). After pointing to my chin, I was escorted over to a section of the store with skin care products by a brand called Odacite and was informed that what I needed was to put their Black Cumin oil on my face. Oil on my pimples? Um, okay lady. Seriously, what kind of drugs were these people on?! I mean sure there is the random “expert” on shows like Dr. Oz who sometimes goes “out of the box” and suggests toothpaste but… OIL? As in the thing that often causes pimples?! These detox people were drinking some serious kale-aid. But the very nice lady did have very nice skin. And she swore to me that a tiny drop of this oil on my face 2x a day would clear up my skin. She also sent me home with their aloe vera based cleanser and a sample of their toner and moisturizer. Skeptical but desperate I gave it a try. Every item I’ve tried from this line, I’ve loved. What I didn’t love? Those dark spots on my face that weren’t going away. So a few weeks ago I went back for another Pure Elements Booster meant to target hyperpigmentation (the line boasts essential oils for multiple skin issues from cell renewal to acne to firmness and more). After a few weeks of using that their Papaya Geranium oil, my hyperpigmentation spots have faded! My skin feels smooth and looks the best it’s looked in years. Of course I still get the occasional zit that makes me feel like my 2008 self all over again but I finally feel more comfortable going makeup free. Also, while I never thought I would come around to the idea of putting oil on my face, I have to admit, I’m a believer! I drank the Kale-aid and I liked it. Yes, I also follow a gluten free and mostly dairy free diet (that 2008 breakout was how I figured out dairy + Jill + Jill’s skin don’t mix so if you’re suffering from major breakouts I highly suggest also trying a dairy free/gluten free diet) but trust me when I say this is the best skin care line I’ve tried in the last eleven years! I love everything I’ve read about this company and what they put (and don’t put) in their products because so many skin care products out there are doing more harm than good. BUT most importantly, the proof is in the pudding lack of pimples. And here’s the best news: Odacite offers 15% off for first time buyers! I highly recommend their Try Me kit and a Pure Elements oil or two of your choice (you can put it on alone or drop it into your moisturizer) to get started. *Also, I’ve started taking a daily pro-biotic in the last week and using Eminence Organics Bright Skin Moisturizer with SPF 30 from Eminence in the day-time. FACE-ING IT FRIDAY: WHAT TO DO WHEN MOUNT RUSHMORE DECIDES TO RELOCATE TO YOUR FACE. | Been There, Tried It.